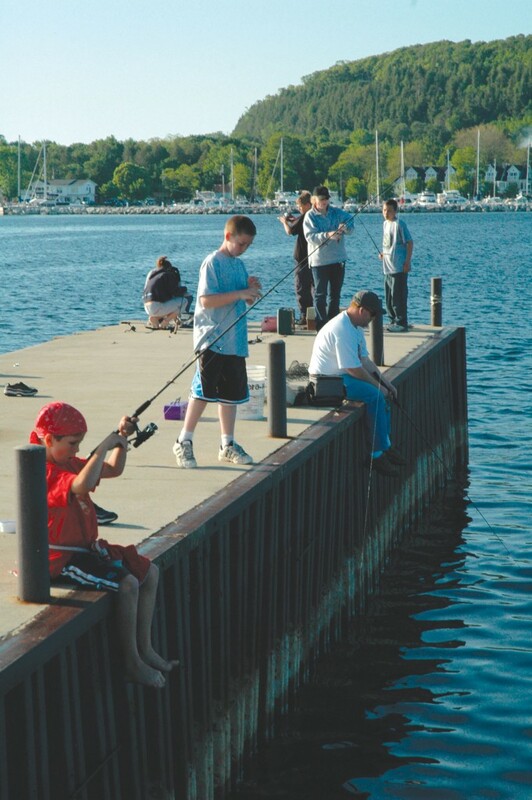 Northern Door County is surrounded by beautiful water and abounds with excellent opportunities for fishermen – but the big water can be daunting for novice fishermen or parents who just want to take their kids out for a few hours of fishing during their vacation. While it is true that there is ample room out there for fishermen with the right boat and the right equipment, and while there are plenty of fine charter operations available for hire, there are also many options for vacationers who would like to wet a line for an afternoon without a lot of hassle. There are many public docks and marinas around the county that allow people to fish from them. However, people fishing on marinas should be reminded to stay on the main docks and to stay away from launch ramps, slips, and finger docks that are rented by boaters. It is also recommended that such fishermen fish away from the boats that are kept in the marinas. Often, the rocky breakwaters on the outside of the docks hold more fish anyway. The shoreline of the peninsula holds smallmouth bass, a slowly rebounding perch population, occasional northern pike and walleye, and in the right season even trout and salmon move in close to the public docks and marinas. Through most of the year, anglers can enjoy success pursuing one or another of these species from public access areas with some basic equipment. From most local spots in the late spring and early summer, smallmouth bass and perch are going to be the most likely catches. In recent years an invasive, alien fish, the round goby, has become a prevalent nuisance commonly caught all over Lake Michigan and Green Bay – though perhaps they are fun for young kids to catch. Carp and lately sheepshead, both considered rough fish, are also sometimes taken. Jerry Daubner of Nan & Jerry’s, the bait and tackle shop in Fish Creek, often recommends Weborg Dock in Peninsula State Park (park sticker required) and the Fish Creek Municipal Dock for bass and perch. “Perch seemed to really start coming back last year, with people catching limits occasionally,” he says. “People were also doing well fishing perch from the Egg Harbor dock and from Murphy’s Park south of Egg Harbor last year.” Jerry also recommends nightcrawlers as the best all-around bait. “We also sell shiners in the early season and fathead minnows as it gets hotter. Leeches have been good for bass, too. Soft shell crabs are an excellent bait for perch and bass, but they are a little expensive for fishing with kids. Hellgrammites are a super excellent bait for perch, but we have a hard time getting them early in the season; usually they become available in the beginning of July,” he adds. Both Jerry Daubner and Roger Jungwirth recommend the causeway over Kangaroo Lake, outside Baileys Harbor, for those who wanted to try inland fishing. Kangaroo Lake holds bluegill, perch, largemouth and smallmouth bass, northern pike and walleyes, all of which can be taken from the County E causeway that divides the lake. Spoons, spinners, and crankbaits attract northern pike in the spring and summer, and live baits like nightcrawlers and minnows work well for bluegills, perch, and bass. As a word of caution, it should be noted that the causeway is a highway with regular traffic. While it is a popular fishing location, one should take special care if fishing with children. A bit of fishing while visiting Door County is a nice way to pass some time and enjoy the waters that make this area unique and beautiful. It is also a great way for families to spend time together. Before you head out, be sure all adults have valid licenses and check the rules and regulations for size and bag limits on the body of water you are fishing. Lastly, a word of advice from personal experience: If you are fishing for larger species from one of the docks, be sure to bring an adequate net with a long handle – otherwise landing the fish you have hooked can become quite a puzzle! Every year the Wisconsin Department of Natural Resources offers a fantastic opportunity for families and novice fishermen to try out the sport. 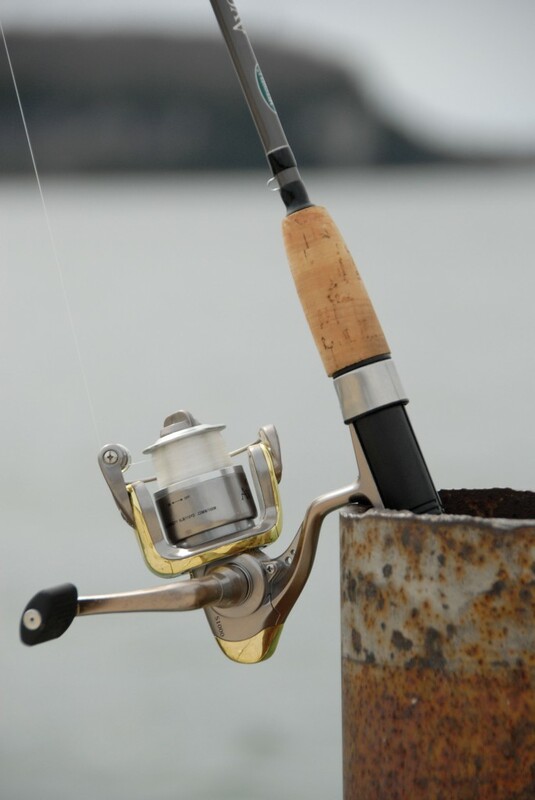 The first Saturday and Sunday of June, this year June 2nd and 3rd, is designated as “Free Fishing Weekend” throughout the state. Both residents and non-residents can fish without a license or a trout stamp on those two days, though all other fishing regulations apply. 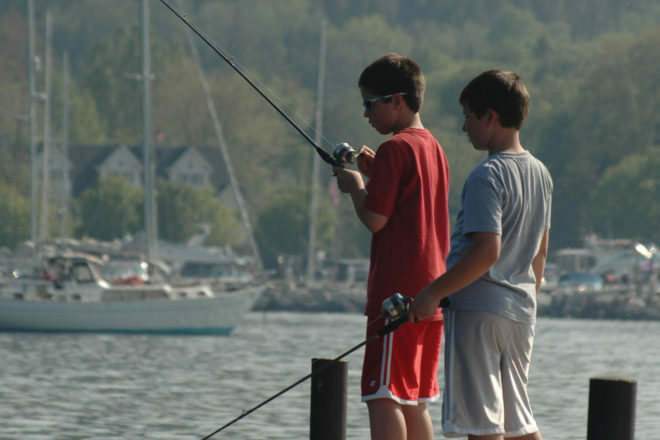 For the rest of the year children under 16 are not required to have a license to fish in Wisconsin, but adults assisting them are required to be licensed if they are handling any fishing equipment. The waived license requirement on the “Free Fishing Weekend” provides adults without a license an excellent chance to take kids out for a day of fishing.